Apple also shared their UI Design Resources, how cool is that? They provided files for Photoshop, Sketch and Adobe XD where based on the iOS SDK, it's just a really good and reliable resource to dig through for your next project or just by curiosity. ...a large, high-resolution, rounded, edge-to-edge display that delivers an immersive, content-rich experience like never before. 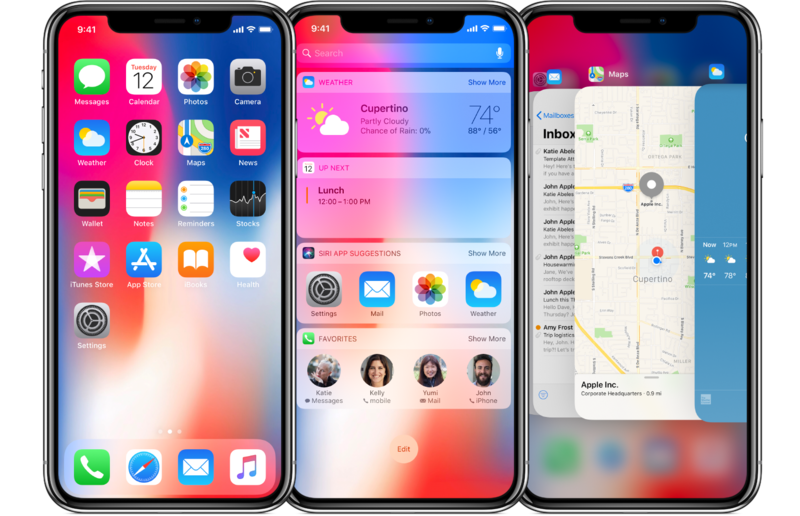 In Portrait, the iPhone X has the same width as its predecessors (iPhone 6, iPhone 7, and iPhone 8) but the display is actually higher of 20% on the vertical space for the content space. To be specific, it's 145pt taller. For our UI assets, they will have to be @3x to support its high-resolution display. There are many things to think about when designing for the iPhone X including the newly sensor housing on the front. Make sure to remember about the backgrounds to give a fully immersive full-screen experience to the edges of the display all the way to the bottom. Apple is advising us to design with a mindset of having the content centered, looks right with the different orientation and to stay away from the corners including the sensor's area. Please take a look at the different possible situations below. We gotta think about the aspect ratio as well especially how your UI will behave with auto-hiding for like playing videos or photo slideshows for example. Since Apple got rid of the "home button of the iPhone X, they had to rethink about the gestures. Just to add to the list, now we have home screen, app switcher, notification center, control center and also Face ID. Regarding iOS 11, I am not a huge fan of how you have 3 different ways to swipe down, from the home screen. We can leave these thoughts of the full release of the next iOS. Yesterday I posted the behind of scenes of a beautiful editorial design project for the TransWorld Surf Magazine. The work was done in 2011 but the style is very relevant to this day and will be in the near future. Greek designer John Noussis was inspired by what google did with Material Design for Android and decided to recreate the same guideline preview for Airbnb. The EPA Graphic Standards System was a guide to consolidate numerous US state offices with their graphic design and communications department.